Can Drug Charges Destroy Opportunities for Student Financial Aid? 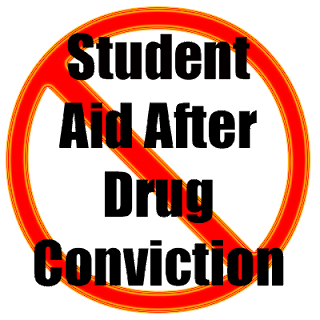 Can a student lose financial aid for the possession or sale of illegal drugs that occurred while receiving federal student aid? Yes. If you are convicted of possessing or selling drugs after you submit your FAFSA, (Free Application for Federal Student Aid) you must notify the financial aid administrator at your college immediately. You will lose your eligibility for federal student aid and will be required to pay back all aid you received after your conviction. How to regain eligibility for Financial Aid after a conviction? The rules require that someone who has become ineligible due to a drug conviction must complete an approved rehabilitation program or pass two drug screens administered by a drug rehab program. Once either of these options have been completed, you can become eligible for financial aid again. Failure to comply with these rules can result in liability to return any financial aid received while the person was ineligible due to a drug conviction. If you are convicted of possessing or selling drugs after you submit your FAFSA, you must notify the financial aid administrator at your college immediately. You will lose your eligibility for federal student aid and will be required to pay back all aid you received after your conviction. Students who are receiving financial aid can have their financial aid eligibility suspended if they are convicted while they are receiving federal student aid student grants, student loans, or work-study benefits. When a financial aid form (FAFSA) is completed, there is a question that asks about drug convictions or offenses that may have occurred while receiving student aid. If a student answers "yes" to this question, they must complete the worksheet that we have included below. Students seeking financial aid must complete a worksheet because it was reported that they had a conviction for possessing or selling illegal drugs or because they left question 23 on the Student Financial Aid Worksheet or the question was not answered or left blank. Here is a sample worksheet sent to a student. 1. 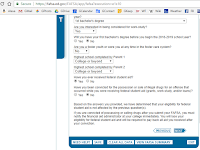 Have you ever received Federal Title IV financial aid? Answer “No” if you have never received Federal student grants, Federal student loans or Federal Work Study. You should also answer “No” if you have never attended college. If Yes, go to question 2 on this worksheet. 2. Have you been convicted for the possession or sale of Illegal drugs for an offense that occurred while you were receiving Federal Title IV financial aid (grants, loans and/or Federal Work Study)? Only include federal and/or state convictions. Do not include any convictions that have been removed from your record or that occurred before you turned age 18, unless you were tried as an adult. If Yes, go to question 3 on this worksheet. 3. Did the offense for possessing or selling illegal drugs occur during a period of enrollment for which you were receiving Federal Title IV financial aid (grants, loans and/or Federal Work Study)? If Yes, go to question 4 on this worksheet. 4. Have you completed an acceptable drug rehabilitation program since your conviction? (2) be administered or recognized by a federal, state or local government agency or court or a federally or state-licensed hospital, health clinic or medical doctor. If No, go to question 5 on this worksheet. 5. Do you have more than two convictions for possessing illegal drugs? Only count convictions for offenses that occurred during a period of enrollment for which you were receiving Federal Title IV financial aid (grants, loans and/or Federal Work Study). 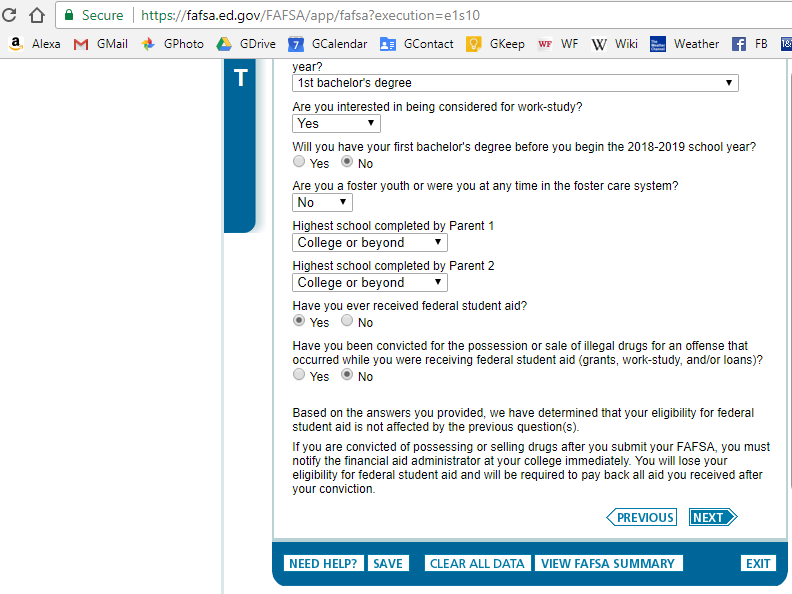 If Yes, you are not eligible for Federal Title IV financial aid for this school year unless you completed an acceptable drug rehabilitation program or passed two unannounced drug tests administered by an acceptable drug rehabilitation program. Even if you are not eligible for Federal Title IV financial aid, you may still be eligible for aid from the State of Florida.